The 3 Mistakes Of My Life: Book Review | a score more! Whenever I pick up a Chetan bhagat book- I am sure of two things- I am going back to my college days, I and living through those array of slangs, breathing in the worldly air and slowly giving myself up to the challenges, trials and failures of life- finally being rescued by the strong power of love and relationship. That’s the whole story about Chetan’s world- you hate it you like it- you are bound to love it. That is why everyone from the IITs and IIMs dotted across the country is grabbing their note pad and writing out their story. That is the reason why publishers are coming up with so many campus books. And we are presented with books like Anything For You Madam, Above Average and many more. But miracles happen once- and 3 mistakes- is not at all a miracles- it is the shadow of the author’s previous books. The book was not much different from his two other books. The writing techniques, the themes that were used in the book and the masala were the same in this book as well, whereas, this particular book was full of stereotypes unlike the other two books of Bhagat. After reading this book, there was a feeling that the writer is quite confused in terms of conveying his true feelings. 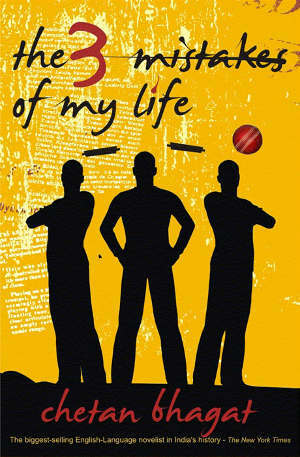 This book is about the life of three friends based in Ahmedabad. There is a detour to Australia presented in the story. The book has some popular themes like love, friendship, cricket, business and religion to make it a complete masala book, just like his other books which can be later modified into a masala Bollywood movie. The title of the book is also vague, just meant for good marketing as the title suggests, all the three are not mistakes in true sense. Out of the three mistakes, two are not error in judgement and people are bound to do such mistakes to grow up in life. The mistakes depicted in the book are hypothetical and depends from person to person. Therefore, not everyone can relate much with the book. The colours of Ahmedabad and the Amdabadi life are depicted in a very vivid and beautiful manner. No other author belonging to this group of storytelling enlivens the setting- giving the place and the native rejoice and feel important- having a berth for themselves in contemporary common read. This entry was posted in Uncategorized and tagged 3 mistakes of my life, ahmedabad, chetan bhagat, three friends by beyondattics. Bookmark the permalink.